KOKOMO, Ind. — Karla Winburn vividly remembers waiting for an outing with missionaries, who promised to take her swimming, when she was a young girl in a Guatemalan orphanage. In July, the Indiana University Kokomo freshman and her sister Lesly, a junior, returned to the orphanage that was their home for seven years, this time as missionaries. They led a group from Kokomo’s Taylor High School to build a house for the children, and to take them bowling. Their younger brother Allan also was part of the group. Lesly, now 22, wasn’t interested in school while living in the orphanage, but decided to take advantage of the educational opportunities available because of her adoption. 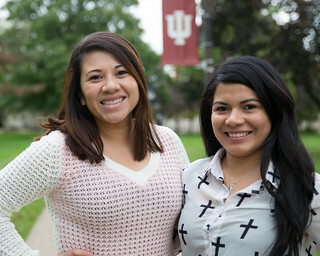 IU Kokomo gave her the chance to fulfill her college dreams, while staying home with her new family. Kokomo residents Bill and Kathy Winburn, who had been missionaries in Guatemala, adopted the sisters and their brother, who is now a high school freshman, six years ago. They spoke little English when they arrived in Kokomo, but worked hard in high school so they could go on to college. Karla plans to earn a degree in nursing, and then become a medical missionary. Lesly studies psychology, and wants to go to graduate school to become a medical social worker. Lesly was 9, Karla was 7, and Allan was 3. Their father was unable to care for them or their older brother, Armando, who was 14. Lesly said the orphanage was like a home, with children living in houses with other children and house parents they called “Mom” and “Dad.” They could choose to be available for adoption or not, and could approve prospective parents. At age 18, they could go to work for the orphanage, or live in a transitional home and work elsewhere. Lesly, Karla, and Allan chose adoption, and turned down a prior opportunity before finding the Winburns. They were among the last children to be adopted before Guatemala closed adoptions by foreigners. Their older brother, Armando, was grown up before they were adopted. They’ve been back three times as missionaries, and see their brother and father every time they return. They also call them weekly, to maintain their relationship. They plan to return again in 2015, to spend a month helping at the orphanage.